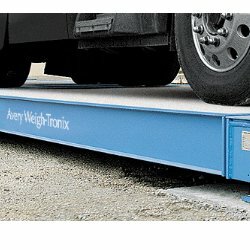 Avery Weigh-Tronix BMC HD is a heavy duty truck scale for vehicle weighing. Its concrete deck and steel substructure make the BMC very strong and very durable. This concrete truck scale is ideal for situations with high traffic or heavy rain or moisture. Concrete decks typically provide improved traction and are more resistant to corrosion in wet conditions than steel deck truck scales. This weighbridge has a composite design - only the top half of the deck is poured, allowing the concrete to stay in compression and resist cracking. Tension forces are handled by the high-strength steel structure below the concrete. All BridgeMont truck scales are also available as a multi-platform system, providing accurate axle weighing plus a legal-for-trade gross weight in a single action. Truck scales that are configured for one-stop axle weighing combine multiple independent scales in a common foundation and are designed to accommodate the vehicle’s axle spacings. AWT05-503652 ..................... BMC 1010 ............ 90,000 lbs .............. 10'-0"
AWT05-503653 ..................... BMC 1210 ............ 90,000 lbs .............. 12'-0"
AWT05-503654 ..................... BMC 2010 ............ 90,000 lbs .............. 20'-8"
AWT05-503655 ..................... BMC 2410 ............ 90,000 lbs .............. 24'-0"
AWT05-503656 ..................... BMC 2610 ............ 90,000 lbs .............. 25'-8"
AWT05-503657 .................... BMC 3010 ............. 180,000 lbs ......... 29'-7 1/4"
AWT05-503658 .................... BMC 3510 ............. 180,000 lbs ......... 34'-11 1/4"
AWT05-503659 .................... BMC 4010 ............. 180,000 lbs .......... 40'-3 1/4"
AWT05-503660 .................... BMC 4710 ............. 180,000 lbs .......... 46' -11 1/4"
AWT05-503661 .................... BMC 5010 ............. 180,000 lbs .......... 50'-3 1/4"
AWT05-503662 .................... BMC 6010 ............. 270,000 lbs ........... 59' -10 1/2"
AWT05-503663 .................... BMC 7010 ............. 270,000 lbs ........... 69' -10 1/2"
AWT05-503664 .................... BMC 7510 ............. 270,000 lbs ........... 74'-10 1/2"
AWT05-503665 .................... BMC 8010 ............. 270,000 lbs ............ 79'-5 3/4"
AWT05-503666 .................... BMC 9310 ............. 270,000 lbs ............ 92'-9 3/4"
AWT05-503667 .................... BMC 10010 ........... 270,000 lbs ............ 99'-5 3/4"
AWT05-503668 .................... BMC 10010 ............ 270,000 lbs ............ 99'-1"
AWT05-503669 .................... BMC 11610 ............ 270,000 lbs ............ 115'-9"
AWT05-503670 .................... BMC 12410 ............ 270,000 lbs ............ 124'-1"
AWT05-503671 ............... BMC 1011 ........... 90,000 lbs ........... 10'-0"
AWT05-503672 ............... BMC 1211 ........... 90,000 lbs ........... 12'-0"
AWT05-503673 ............... BMC 2011 ........... 90,000 lbs ........... 20'-8"
AWT05-503674 ............... BMC 2411 ........... 90,000 lbs ........... 24'-0"
AWT05-503675 ............... BMC 2611 ........... 90,000 lbs ........... 25'-8"
AWT05-503676 ............... BMC 3011 ........... 180,000 lbs .......... 29'-7 1/4"
AWT05-503677 ............... BMC 3511 ........... 180,000 lbs .......... 34'-11 1/4"
AWT05-503678 ............... BMC 4011 ........... 180,000 lbs .......... 40'-3 1/4"
AWT05-503679 ............... BMC 4711 ........... 180,000 lbs .......... 46'-11 1/4"
AWT05-503680 ............... BMC 5011 ........... 180,000 lbs .......... 50'-3 1/4"
AWT05-503681 ............... BMC 6011 ............ 270,000 lbs .......... 59' -10 1/2"
AWT05-503682 ............... BMC 7011 ............ 270,000 lbs .......... 69' -10 1/2"
AWT05-503683 ............... BMC 7511 ............ 270,000 lbs .......... 74'-10 1/2"
AWT05-503684 ............... BMC 8011 ............ 270,000 lbs ............ 79'-5 3/4"
AWT05-503685 ............... BMC 9311 ............ 270,000 lbs ............ 92'-9 3/4"
AWT05-503686 ............... BMC 10011 .......... 270,000 lbs ............ 99'-5 3/4"
AWT05-503687 ............... BMC 10011 ........... 270,000 lbs ............. 99' 1"
AWT05-503688 ............... BMC 11611 ........... 270,000 lbs ............. 115' 9"
AWT05-503689 ............... BMC 12411 ........... 270,000 lbs ............. 124'-1"
AWT05-503690 ............ BMC 1012 .................. 90,000 lbs ................ 10'-0"
AWT05-503691 ............ BMC 1212 .................. 90,000 lbs ................. 12'-0"
AWT05-503692 ............ BMC 2012 .................. 90,000 lbs ................. 20'-8"
AWT05-503693 ............ BMC 2412 .................. 90,000 lbs .................. 24'-0"
AWT05-503694 ............ BMC 2612 .................. 90,000 lbs .................. 25'-8"
AWT05-503695 ............ BMC 3012 ................. 180,000 lbs ................ 29'-7 1/4"
AWT05-503696 ............ BMC 3512 ................. 180,000 lbs ................ 34'-11 1/4"
AWT05-503697 ............ BMC 4012 ................. 180,000 lbs ................ 40'-3 1/4"
AWT05-503698 ............ BMC 4712 ................. 180,000 lbs ................ 46' -11 1/4"
AWT05-503699 ............ BMC 5012 ................. 180,000 lbs ................ 50'-3 1/4"
AWT05-503700 ............. BMC 6012 ................ 270,000 lbs ................. 59' -10 1/2"
AWT05-503701 ............. BMC 7012 ................ 270,000 lbs ................. 69' -10 1/2"
AWT05-503702 ............. BMC 7512 ................ 270,000 lbs ................. 74'-10 1/2"
AWT05-503703 ............. BMC 8012 ................ 270,000 lbs .................. 79'-5 3/4"
AWT05-503704 ............. BMC 9312 ................ 270,000 lbs .................. 92'-9 3/4"
AWT05-503705 ............. BMC 10012 .............. 270,000 lbs ................... 99'-5 3/4"
AWT05-503706 .............. BMC 10012 .............. 270,000 lbs ................... 99' 1"
AWT05-503707 .............. BMC 11612 .............. 270,000 lbs ................... 115' 9"
AWT05-503708 .............. BMC12412 ............... 270,000 lbs ................... 124'-1"